Dengue Fever now has become an epidemic again. The rainy season often causes puddles in various places, which of course impact on the increasing number of places where mosquitoes can nest and breed. TMD asking residents to pay more attention to the places that could become mosquito breeding areas as it is not limited to water in the shower or other water storage. Consider also your yard, some kind of Bromelia plants and Banana Trees store water, either from rain or watering. Do continuous mosquito nest eradication. If we are negligent it is possible that the larva can turn into adult mosquitoes that can infect humans. Make a clean and healthy environment using good practices in your own home. TMD will continue to conduct the pest control program and please inform TMD if any of your family members are affected by dengue so TMD can do additional pest control around the neighbourhood. Contact TMD Call Center at (021) 55 777 557 if you need assistance for pest control outside the TMD routines pest control program. This is to inform you that the Internal Shuttle Bus route to and from Lippo Village North and Lippo Village West will temporary cease operations commencing Monday, January 21, 2019. There are no changes, however, in the other bus services and schedules at the present time. We will continue to review the bus capacities and ridership, as well as trying to improve the services and shall keep you updated on the progress of transportation provided in Lippo Village. 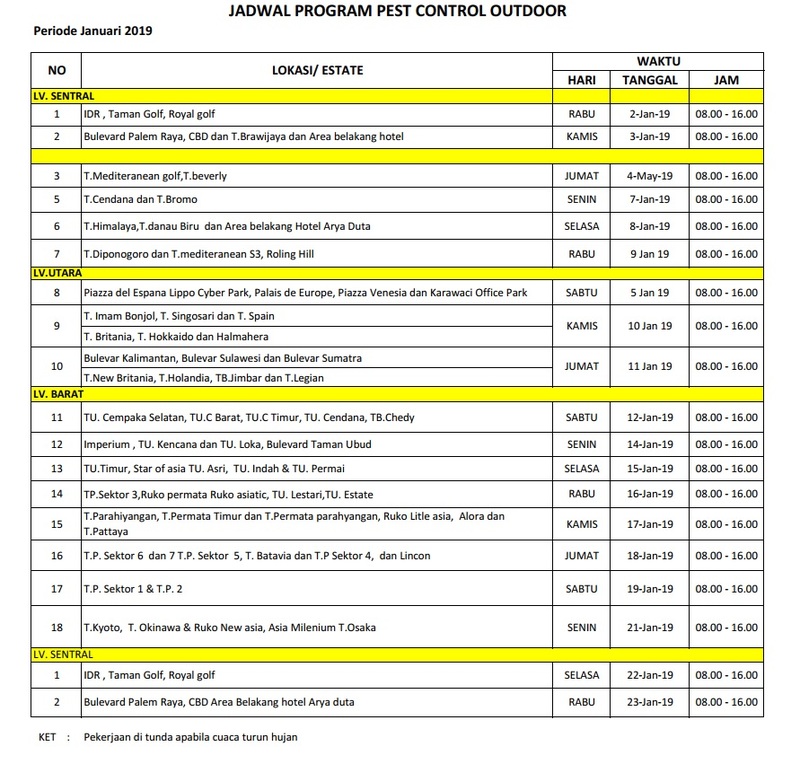 The program will be implemented starting on Wednesday, 02 January 2019 (please see below schedule).